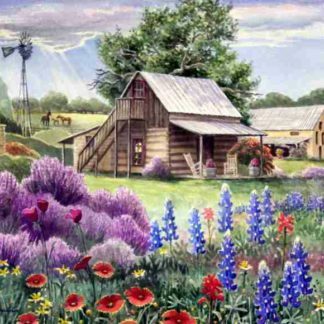 Texas landscapes wall art pictures by Texas artists like State Artist of Texas Dalhart Windberg, Texas cowboy western artist poet Wallace Simpson, and Texas Hill Country watercolor artist Jane Mauldin. The lone star state enjoys amazing and varied landscapes. Mountain vistas, desert arroyos, urban cityscapes, miles of sand beaches, wildflower fields abound. 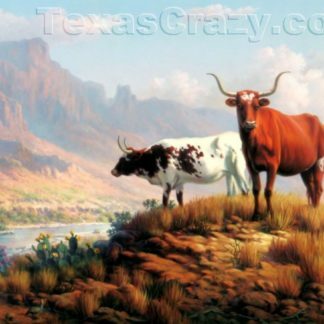 Texas Crazy has assembled collectible landscape art pictures, prints and paintings from our online Texas art collection. We offer custom framing for your landscape art, featuring reclaimed wood for that rustic home or office and custom antiqued chocolate beaded frames for a more elegant environment. Opening up a new office in Texas? We would be happy to help you with Texas Office Decor, consisting of western bronze sculptures, Texas history art and more. These Texas themed wall artworks add flair to your home and office decor and show you are proud to be a Texan! For more details, click on any picture below.